DIOR HOMME suit and CHROME HEARTS necklaces and bracelet. VALENTINO shirt and pants and CHROME HEARTS necklaces. 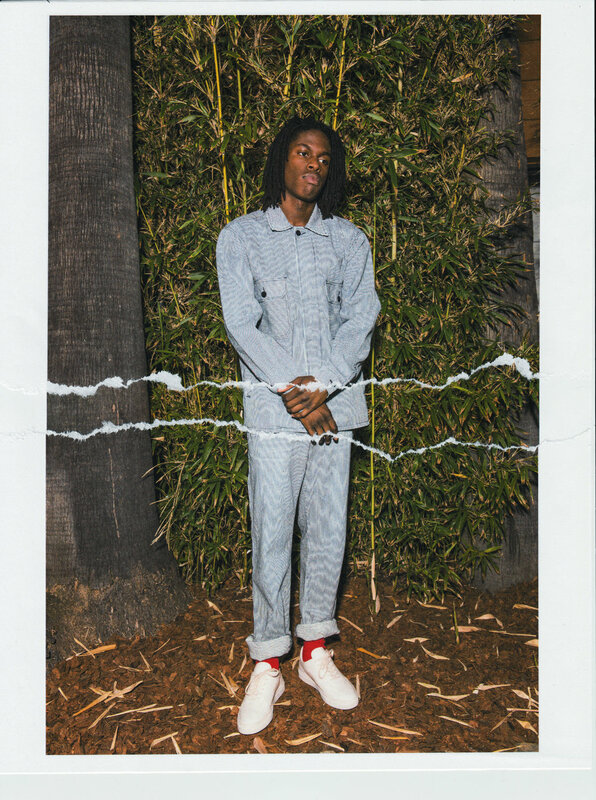 Last fall, Daniel Caesar experienced the breakthrough moment that many love-struck guitar strummers and ditty-hummers dream of: Freudian, his 10-track debut album featuring gorgeous odes to significant others and heart-wrenching ballads to lost ones, dropped and became one of the most buzzed about efforts of 2017. Followers plucked lines from cuts like “Get You” and “Best Part” to show their boyfriends and gal pals appreciation via Twitter and Instagram captions. Stevie Wonder, Erykah Badu, and producer Rick Rubin became fans. He earned two Grammy nominations. And now, at 23, Caesar is starring on Coachella stages, selling out venues all over, and has been crowned The Next Great One—the savior of an R&B genre that’s leaned a bit too far into its relationship with Hip-Hop’s rumbling drums and rap-like delivery as of late. He sings with the impassioned ease of Marvin Gaye. His introspective and conversational lyrics recall a young Stevie’s. Caesar’s skillset is serving him well. FENDI shirt, VALENTINO pants, COMMON PROJECTS shoes, and CHROME HEARTS necklaces and bracelet. “This past year has really been incredible,” the Oshawa, Ontario native says, a day removed from singing for thousands at the Broccoli City Festival in Washington, D.C.
HUDSON JEANS shirt and pants, ANONYMOUS ISM socks, and COMMON PROJECTS shoes. His newfound popularity and the uptick in requests for his services means life isn’t what it used to be. Simple changes like no longer being able to shop in public are ones Caesar can laugh off. But for a person who’s more of a homebody, others are a bit tougher to manage. LOUIS VUITTON shirt, FENDI pants, OLIVER PEOPLES sunglasses, and talent’s own jewelry. As is true with the greats, his international travels and new experiences will be represented in the music he’s penning now. Just know that the expectations of others won’t. 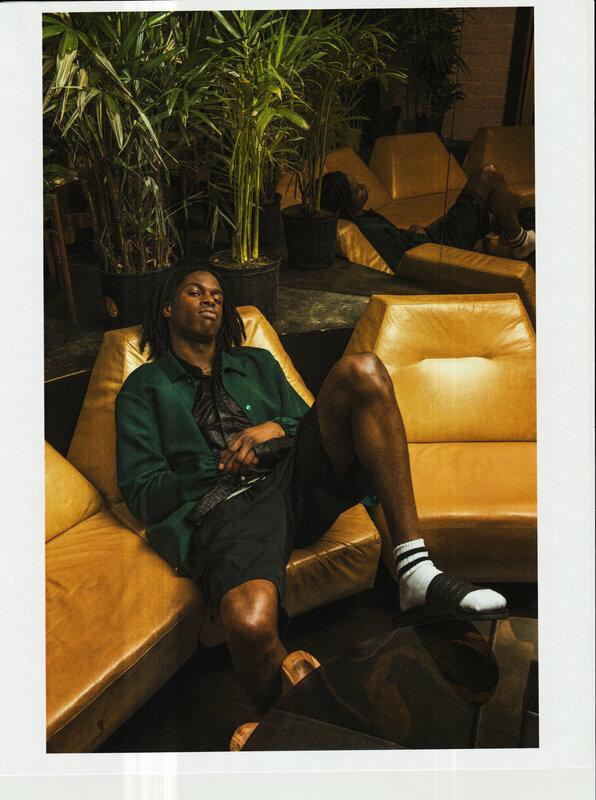 VALENTINO jacket, DIOR HOMME shirt, CHAMPION shorts, ANONYMOUS ISM socks, and ADIDAS shoes.